We have invited Teresa Sullivan to come teach in February! She will be here for two days teaching fun do-able beady projects. Are these not the coolest things ever? 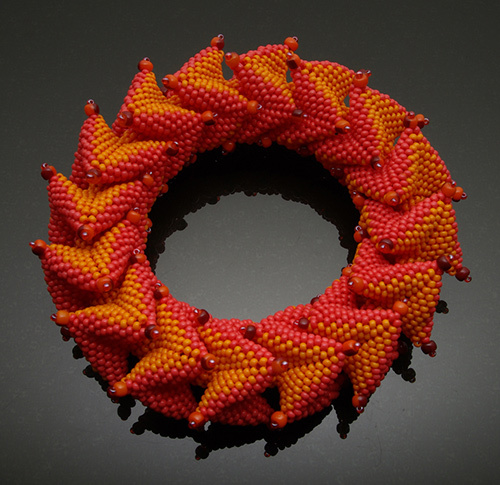 Make a bunch of them and create a bangle. Make just a few and you have a necklace. Maybe a pair becomes a pair of earrings. On February 5th, we will be making bracelets galore! Two classes in one day. This is a class for everyone, all levels of beaders, you can’t go wrong with this one. 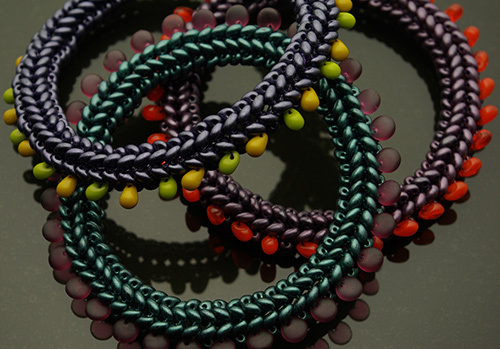 Bangles with Dangles bracelets are made with two hole beads, accented with bright drop beads. Fair warning: these are addictive and best worn in sets of three. 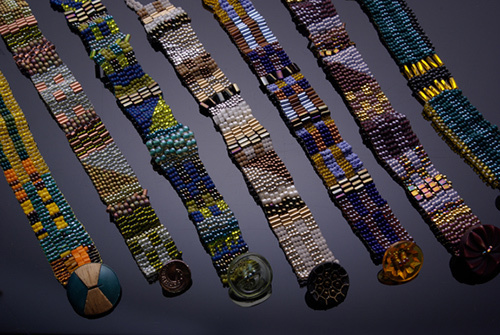 In Klimt Meets Kente we will create mosaic-like effects with relatively simple techniques and a fun variety of beads in different shapes and sizes. Your choice of colors can evoke the legendary Kente cloth of Ghana, the scintillating paintings of Gustav Klimt, or a long-cherished family quilt. Raid your button stash for a clasp! Check your calendar and give us a call at 410.296.0405. We’d love to have you join the fun. « Previous: What to do? What to do?